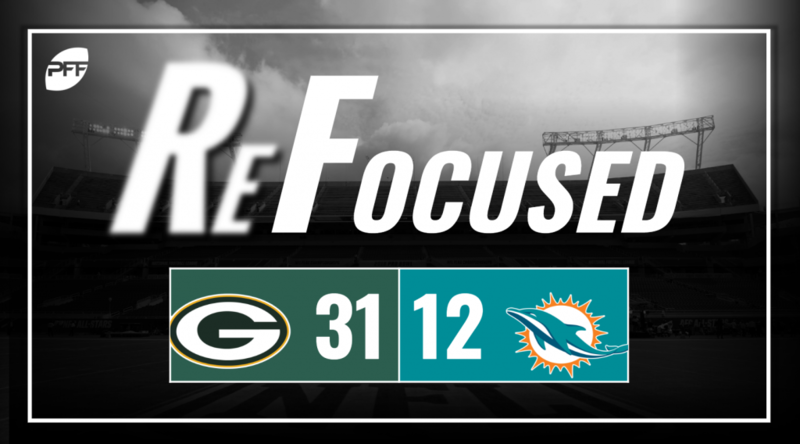 The Green Bay Packers defeated the Miami Dolphins, 31-12, in Week 10 of the 2018 NFL season. Jaire Alexander had a nice red-zone pass breakup on a crossing route intended for DeVante Parker, and Josh Jackson gave up a 39-yard catch and run to Danny Amendola when he attempted to undercut a slant route but missed the ball. Jackson also missed a tackle on Parker on a screen route, as the Miami wideout stiff-armed him to the ground on his way to a first down. Kyler Fackrell beat left tackle Zach Sterup on an inside spin move for a first-quarter drive-ending red-zone sack. Bashaud Breeland intercepted a third-quarter crossing route from Brock Osweiler intended for Amendola. Despite connecting for two touchdowns, Aaron Rodgers couldn’t get on the same page with Davante Adams on a number of occasions. While the box score will show respectable numbers for the two, it could have been much better. Rodgers has been one of the best quarterbacks this season, but miscommunication with his receivers continues to hurt his numbers. It was an incredibly efficient day for Aaron Jones, as he gained a first down or touchdown on 53% of his rushes. The Packers’ offensive line needs to be given credit, though, as Jones averaged a whopping plenty yards before first contact and made the most of what was given to him. Osweiler allowed the snap to slip through his hands, and the Packers recovered the fumble to end the Dolphins’ first drive of the game. And he never seemed to be able to find a rhythm for the rest of the game. Osweiler was routinely sacked behind a patchwork offensive line for the Dolphins. Frank Gore forced multiple missed tackles on a long run early in the contest, but that was just about the only highlight for the Dolphins’ ground attack. There wasn’t much good on the defensive side of the ball for the Dolphins. but Cameron Wake and Robert Quinn generated some pressure. Wake notched a sack and Quinn grabbed a pair. Outside those sacks, though, the Dolphins’ defensive line was held in check. Linebacker Kiko Alonso had a game he’d like to forget, as he was the culprit of a few missed gap assignments and a couple of poor plays in coverage. Alonso was unable to nullify the bad with enough good, as he recorded just two total tackles. The Packers offensive line was dominant all game long as HB Aaron Jones had massive holes all game long. The Dolphins’ inability to convert drives into touchdowns and repeatedly settling for field goals became too much to overcome.